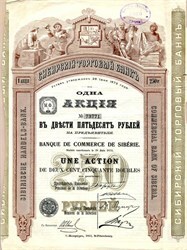 Beautiful certificate from the Commercial Bank of Siberia issued in 1912. This historic document has an ornate border around it with a vignette of four men lounging around with various tools of employment: a gun, paper, pick-ax, and a pen and ledger. This item has the printed signatures of the Company�s Executive Chairman, and Executive Members, and is over 100 years old.